Compared to the late 1970s, when the Austrian voting behavior was characterized by extraordinary stability, low electoral volatility, and high turnout rates, the 1980s and 1990s stand for exceptional changes and ruptures elicited primarily by the rise of the right wing populist FPi (Freedom Party of Austria). This volume of collected papers investigates the permanent changes of Austrian voting behavior over the past forty years and analyzes causes and consequences for party competition and the electoral process in Austria during the first decade of the twenty-first century. 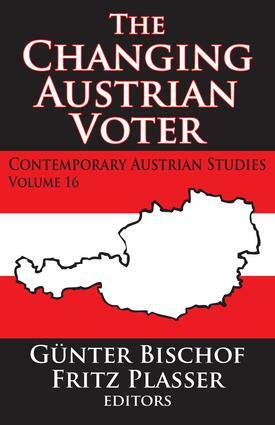 Some of the contributions include Oliver Rathkolb's wide-ranging historical typology which addresses the Austrian voters in the twentieth century from the perspective of expanding voting laws and the struggle for political participation and integration. Based on compact trend data of Austrian Election Studies, Fritz Plasser and Peter A. Ulram present an empirical overview of trends and patterns in Austrian voting behavior covering the period from 1970 to 2006. Both the rising electoral volatility and the permanent increase of constant non-voters since the 1980s are dealt with. The development and dynamics of regional elections in Austria since the mid-1980s are reconstructed and related to the electoral behavior on the federal level. Kurt Richard Luther analyzes electoral strategies and the rise and fall of Austrian right wing populism from 1986 to 2006, focusing in particular upon changing styles of electoral mobilization. The media's role in framing the Austrian campaign discourse and the specific characteristics of campaign coverage in Austria are also in focus. This well-conceived volume also contains review essays, book reviews, and the annual review of Austrian politics. A mandatory selection for the bookshelves of all those interested in Austria or European Studies, this book provides invaluable information regarding the electoral process in Austria. Did the ÖVP Lose, or Did the SPÖ Win the 2006 National Parliamentary Election?